Jim used an 11m pole to fish a bait close to the far bank ‘cover’, and was rewarded with a few small chub on a very cold day. 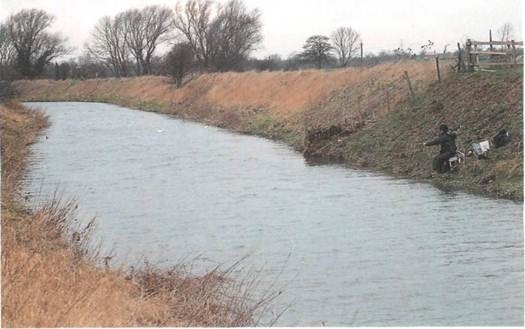 The Bottesford AC stretch of the upper Witham is at Westborough in Lincolnshire, near the A1 between Grantham and Newark. From the A1, turn off for Long Bennington, then follow the signs to Westborough. Park in front of the church, then walk down the right hand side of the church to the river Bottesford AC do not sell day tickets for their stretch of the upper Witham, but club membership cards are available from tackle shops in the area. As well as lots of chub, the venue has a good head of roach and dace, and there are also isolated shoals of big bream. Chub hug the far bank wherever there is the slightest bit of cover -even where there are only a few inches of water. 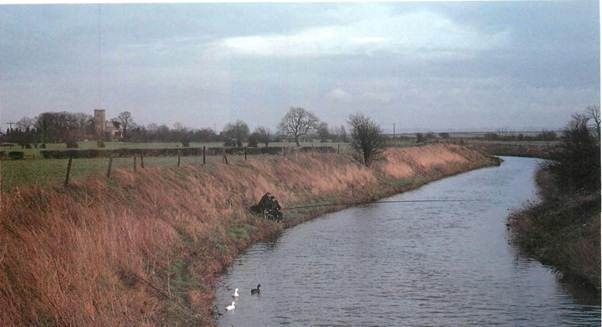 The river is of uniform width and depth, and the banks are featureless and very steep, thanks to drainage engineering ‘improvements’ in the 1960s. 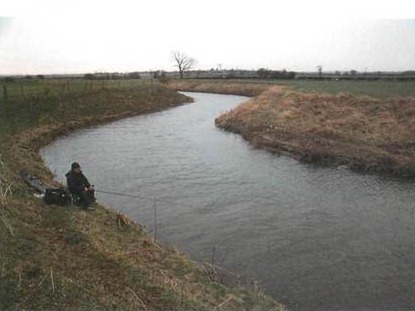 The third spot Jim tried was at the bottom of the long field, where the main flow spreads out along the far bank. He didn’t catch anything here, but he did get a bite to tell him that there was at least one feeding fish there. 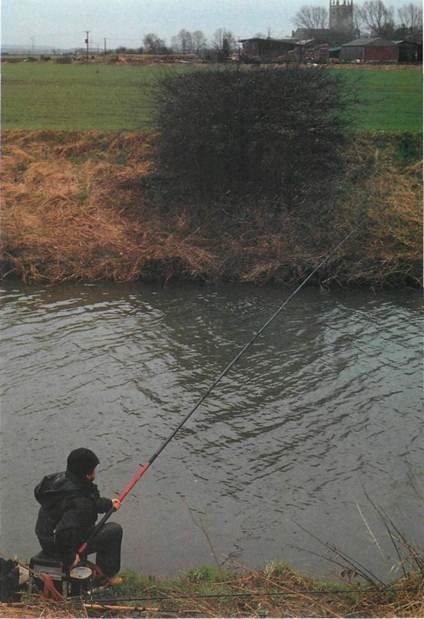 It’s easy to slip into bad habits, and one of the commonest, according to Jim, is to forget the importance of keeping off the skyline, treading softly and staying quiet and still so as not to scare the fish. This is obviously important on narrow, shallow rivers. The second swim looked inviting enough, with a sweeping bend opening out below Jim seemingly sure to house a chub or two. But on a day when the water temperature was only 3°C/38°F he was unable to tempt any chub from the main flow, despite his very best efforts with both waggler and bomb. 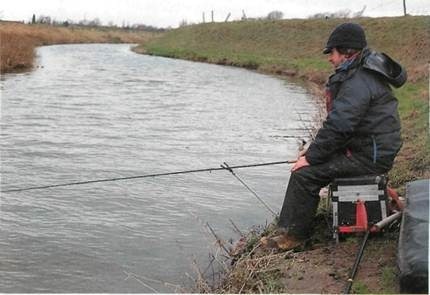 The long pole is a good method in matches, when bankside disturbance is inevitable, but Jim never thought he would have to resort to it on a pleasure trip. Features are conspicuous by their absence on the Bottesford AC stretch of the upper Witham, but chub can be found wherever there’s the slightest cover from overhanging plants. The lower Witham around Kirkstead is wide and featureless, offering few clues as to the whereabouts of its resident bream and roach. Sheffield match anglers have long regarded the venue as a home away from home – among them Jim Baxter. 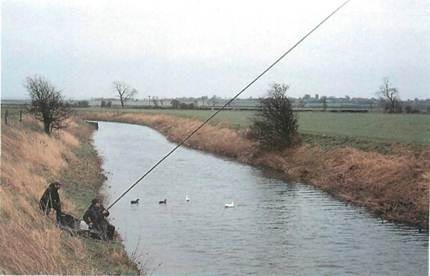 The upper Witham is a delightfully unspoilt venue, twisting and turning its vay through the Lincolnshire countryside, with tree-lined banks and every kind of imaginable swim, from eddies and riffles to deep, dark pools… at least it was until the 1960s, when much of it was ‘improved’ by drainage engineers. In many places its course was partially straightened, its trees were uprooted, its bottom was dredged and its banks were ruthlessly landscaped – all .n the name of flood prevention — leaving it is featureless as the lower river, only narrower and faster-flowing, with chub the nain species. Tuesday, only two days after a big match. Lots of chub were caught in the match, so these fish were likely to be very difficult to attempt again so soon. Jim also learned that the venue averages lm (12yd) wide and is around 1m (3ft) deep in the main flow, and that the best methods for the chub are the stick, waggler md straight lead – and the long pole right across under the far bank. After walking the stretch, Jim earmarks four swims. The first is just below an S-bend at the top of the long field. Here the main flow is on the inside and, as Jim puts it, “just picking up speed again”.